Headed to a wedding? Why not make a handmade card! Brides and grooms will appreciate the time and special effort you took to craft an original greeting card. Best of all, the sentiments inside the card will truly be from your heart. Have lots of upcoming weddings to attend? Take advantage of these 24 DIY wedding card ideas! 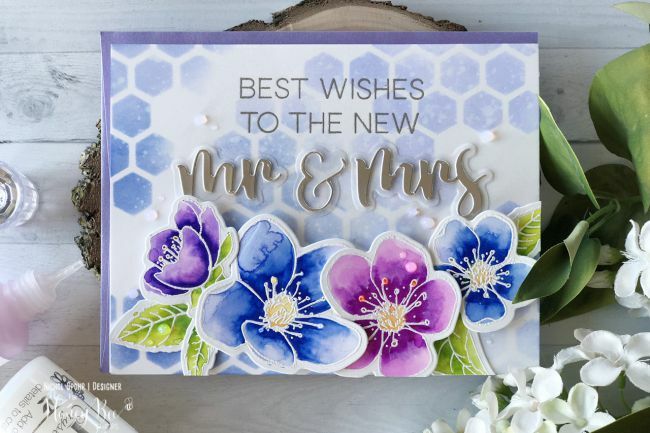 This metal floral themed card looks challenging to make, but if you follow the video provided in the tutorial by Nichol Spohr LLC, you will find that it's actually quite easy. It's made from stamps and gold embossing powder and is filled in with watercolor paint. The results are just stunning. This technique can be used to make other paper crafts as well! Congratulate the bride and groom with an embossed floral card that has a lovely pastel colored background. Add some bling, and you are ready to give a card that will be treasured as a keepsake for years to come. So pretty, you could frame it and hang it on the wall as artwork. This paper daisy card is another example of a beautiful handmade card that can work for any occasion. With a collection of paper flags adorned in different sentiments, you'll be ready when the need arises to give someone a handmade a greeting card for a wedding, birthday, and more. This simple and classy wedding card is sure to please the new couple. Its color palette gives it a sophisticated and sharp look—certainly making it a card they'll be excited to display in their home. All it takes is a little bit of folding and cutting, followed by adding pretty embossed stickers. Romantic Rose Cutout Card and Favor Box. This romantic rose floral cutout card was made using a BigShot machine and ThinLit dies. Make the card and some favor boxes to match from mint green and white colored paper—a beautiful and elegant wedding design theme. Are the bride and groom Harry Potter fans? Then this is the perfect card for them! Based on the imaginary game featured in the books called "Quidditch," it becomes a cute play on words that the wedded pair will love. Make a beautiful white die cut gatefold style wedding card to congratulate the happy couple. What makes this card sweet is that a romantic paper die cut was cut in half and applied to the front of the card. We think the results are fabulous. A stunning diamond ring themed greeting card can be made from embroidery floss and card stock. This wedding card is so pretty, the bride might want to frame it as a wedding wall decor keepsake. Sometimes we don't have enough time to make a card from scratch and need a quick wedding card to give to the bride and groom at the last minute. Floral printable cards may be used for any occasion, but they do work well as a wedding themed cards. Sustain My Craft Habit offers two free floral printable greeting cards for download. Quilling is the art of wrapping strips of paper into different shapes and gluing them into a pattern onto a piece of cardstock. Pretty quilled flowers on a light green cardstock background make a lovely handmade wedding greeting card. Quilled flowers are not expensive but have a high impact on the design of the greeting card. A tuxedo and a wedding dress are a classic symbol of marriage. Made from embossed paper and added bling, this white wedding dress and black suit die cut paper element, create an elegant statement on the front of this DIY card. Watercolor flowers are always beautiful and are perfect for a wedding card. This greeting card is also suitable for other occasions. Paper Trail Design offers this cute printable for free download on their site. Do you want to give the bride and groom a handmade card but think of yourself as artistically challenged? This washi tape and Kraft paper card may be for you! It's quick and simple to make. Good results are almost guaranteed. White is a symbol of purity and is lovely when used for wedding greeting cards. A simple swiss dot embossed background adorned with two heart shapes and a beautiful ribbon is perfect for a classic wedding card. Make the sweetest wedding dress greeting card from a white paper doily. It looks fabulous paired with a brown Kraft paper background. The greeting card design also doubles as a bridal shower invitation. Attach a paper doily to a cardstock background and add the monogram of the bride and groom for a personalized wedding card. A unique floral and gold heart greeting card is perfect for those attending a summer wedding. The gold heart symbolizes eternal unconditional love surrounded by pretty white paper flowers—what a lovely card that is also a bit unusual! Most wedding cards are either white or pastel colored. Some brides are avant-garde and may enjoy a boho styled wedding card. The colors are bright, sunny, and cheerful and will send wishes of joy to the happy couple. This version of a die cut wedding card is designed using a rich gold color scheme. What an elegant and luxurious handmade card. Sometimes a simple card is the best. Just print out the letters, heart, and numbers in any word processing software. Then cut with an Xacto knife, being careful to leave the bottoms uncut. Pop them out, so they are standing at a 90-degree angle. You can't use an envelope with this card unless you flatten the card, but who cares! The design of the card is so sentimental that it will be treasured. Custom 3D Wedding Card DIY from Hello Cupcake Cook! Cut out some flowers on a digital die cut machine and glue onto cardstock with a 3D look. Add some ombre watercolor paints to the background, and you are finished. You now have a gorgeous card that looks like a work of art. A gift of cash to the happy couple is often one of the most appreciated wedding presents. Make a charming envelope card to present your money gift. A heart filled with flowers is a simple but elegant wedding card—relaxed, upscale, and understated simplicity all in one design. Two lovebirds facing each other are the symbol of a marriage union. This is a whimsical card that will bring a smile to the happy couple. Every couple needs an album to organize all of their wedding cards. Why not give your card tucked into a handmade keepsake album? This extra-special gift will surely stand out.